In a hydroponic system transplanting is easy – just move your plant from it’s current sized cube into a larger one. 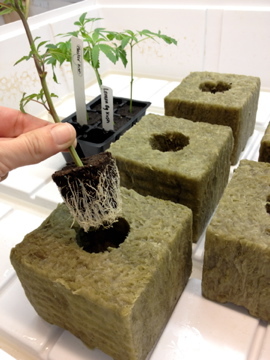 You should transplant when you start to see roots emerging from the smaller cubes, about an inch below the cube. The plant in the picture above should have been transplanted already, but this is how I received it. To transplant simply plug the smaller cube into the pre-cut whole in a larger cube. Soak and condition your Rockwool first, but make sure to use whatever water or nutrient solution you have already have been using on your plants. Don’t change anything else at this stage to avoid shocking your plants. After transplanting you will not need to water for 2-4 days. The cube will have plenty of water in it. You want the fit to be snug, but not tight. 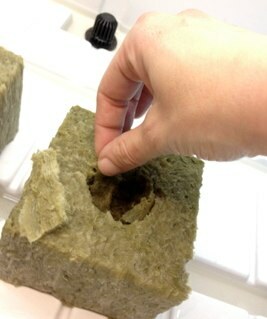 If the hole is not large enough, you can push the Rockwool out and/or down like clay to make the hole larger. If the hole is too small for some reason prepare smaller cubes and rip it up to make a tighter fit. Don’t do this too much, it does ruin the structure of the cube, made to be optimal. Do not ever remove the plant from its cube, it is not necessary. You are just putting one cube into another. Clean your equipment before using it. Don’t feed shocked plants for at least one week. They cannot properly use the nutrients anyway.